Bottombracket: 1500 Pots of Flaming Flames. 1500 Pots of Flaming Flames. Last Saturday eve I gathered up some people and deposited them at WinterCity, Hogtown's trompe l'oeil to the long, dull days and nights between November and April. 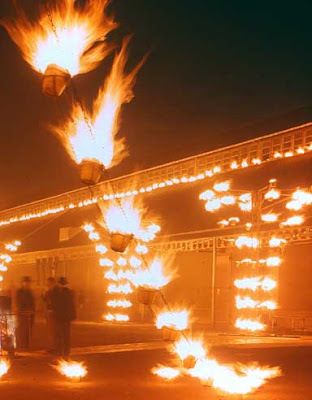 This French troupe of fire sculptors were paid to distribute hundreds and hundreds of pots of fire upon the town square, some of which were ingenious mechanical sculptures like the chimney of heat depicted in the photo, and others too various to describe. There were also cylindrical coal warmers that sparked when you blew on them. I billed the party "Fire and Ice" as skating on the rink at City Hall was to be involved. Only two of us skated in the end, but so what. The atmosphere of that normally dead square was positively transformed as snow drifted down and a thousand fires burned against the darkness of the winter night. A bottle of spiced rum I'd actually had the foresight to bring made things even better. We city workers were just amazed at the absence of barriers, barricades, and guards barring the public from the sculptures. I even got a free all-white touque just for walking into a tent hung with single mittens. "I could have burnt my hand fifteen hundred times over!" my colleague Cris reported gleefully to our liability-obsessed boss today. 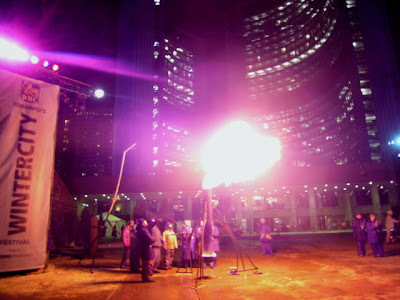 More incredible still: They're at it again this Friday and Saturday eve, so get thee to 100 Queen Street West to sup full with wintry fire. The Summer Past: My CHIN Race Movie.